Peanut Butter and Jenny: iz my Purr-day!!!!!! Happy Birthday Peanut Butter! Very cute baby pictures. You were a tiny girl! Happy Birthday PB! We just loved all the photos and are so glad you are enjoying yourself! 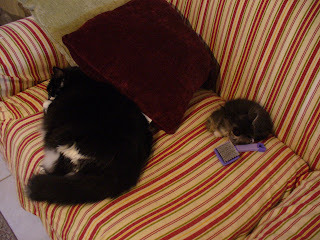 Today seems to be a big birthday day among our Cat Blogsphere friends. So much celebration! Happy Birthday, Peanut Butter! You sure were a tiny little P-nut! I hope you have a wonderful day playing with Red Mouse. Happeh Tooth Birfday, Peanut Butter! Tell me, is it true that you stick to the roof of your mouf? 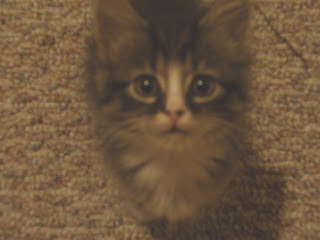 You were such a cute little kitten, and now you are a boo-ti-full slightly bigger cat! Bless heart, Peanut Butter! 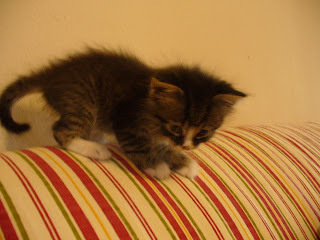 You was the cutest little baby cat ever! Hope you have the greatest purrday, sweetheart! Happy Birthday Peanut Butter, you look really nice today. 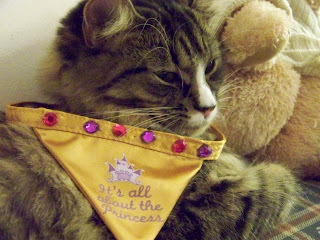 Happy Birthday Peanut Butter - we thinkk this is the purrfect week for birthdays! Happy Birthday, Peanut Butter! We hope you enjoy your day! Happy Birthday! Those are adorable kitten pictures of you. We hope you had a wonderful day! Happy belated birtday Peanut Butter. happy (late - sorry for that) birthday, girl! smooches to both of you! Happy, happy birthday to you! Pictures are so cute!! 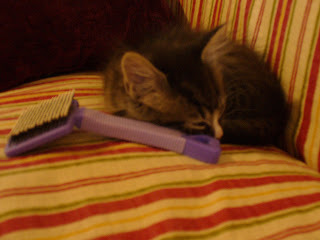 Oh Peanut Butter, you were so adorable as a baby kitteh!